Olive oil is just as it sounds … oil extracted from the flesh of fresh olives. If you crush olives, the result is oil, pomace and some water. The oil, once separated out, is fresh olive oil. It’s that simple. Scientific research has indicated olive oil can assist in the fight against heart disease, cancer, diabetes and Alzheimers. The polyphenols in olive oil are antioxidants, which have also been shown to help fight diseases including some type of cancers. Olive oil is also known as one of the best sources of monounsaturated fatty acids, a type of fat that has been shown to improve blood cholesterol levels. Extra Virgin olive oil is the highest quality of olive oil available. Olive oil is considered extra virgin when it has been produced by a simple pressing of the olives – without any other processes – which allows it to provide the highest level of health benefits. Click here for the official definition of extra virgin olive oil. Besides the highest quality, extra virgin, what are the differences between the other grades or categories of olive oil I might find on a store shelf? Olive Oil: Lesser quality olive oil, which has been refined through degumming, neutralization, bleaching, and/or a deodorization processes; then blended with 5% to 15% extra virgin or virgin olive oil. Pure and/or Light: Pure and light are marketing terms used for olive oil that has been refined and mixed with a small amount of extra virgin or virgin olive oil. Light or Extra Light olive oil are lighter in flavor, aroma and many times color than extra virgin olive oil but do not contain less calories. Is color a good indicator of quality for extra virgin olive oil? The color of olive oil is not an indicator of quality. The color of olive oil can range from vibrant green to golden yellow. What do first press and cold press mean? These terms are used by producers on their labels to emphasize that extra virgin olive oil is an unrefined, natural product that has undergone a single, simple milling process – without heat or other processing that could alter its quality. What should I look for when buying “extra virgin” olive oil? When buying extra virgin olive oil, consumers should look for products packaged in dark glass bottles or other containers that protect it from light. The label should clearly indicate where the olives were grown, their harvest date, the oil’s grade, and a “best by” date. “Best by” dates are usually one to two years from the time the oil was bottled. With olive oil – unlike wine – freshness is important. What are the differences among varieties such as Arbequina, Koroneiki, Frantoio, etc? Arbequina, Koroneiki, and Frantoio are just three examples of hundreds of varieties of olives grown for milling into olive oil. Each olive variety has its own size and color characteristics and distinct flavors. Differences among the varieties of olives are similar to the differences among the varieties of grapes used to produce the different flavors in wines. High quality, delicious extra virgin olive oil is produced in more than 30 countries around the world. Olive oil is perishable and should be stored in a tightly-sealed container in a cool, dark place such as a cabinet or a pantry. Once opened, a container of olive oil should be used within a few months. How long can I keep a bottle of extra virgin olive oil? As long as its stored away from heat and light, an unopened bottle of high quality extra virgin olive oil may last up to two years from the date it was bottled. More and more producers are now scientifically testing their oil to provide trusted “best by” dates for consumers on each container. Once opened, the oil should be used within a few months. What do you cook with extra virgin olive oil? Whether dipped, drizzled, sautéed or fried, extra virgin olive oil can be a healthy ingredient in any meal or snack. It can even be a healthy and tasty substitute for butter in baking and other preparations. Isn’t extra virgin olive oil expensive? Olive oil has been produced in the US for more than 150 years. There are approximately 45,000 acres of olives planted exclusively for the production of olive oil in the United States. Olive oil is produced in California, Arizona, Texas, Georgia, Florida, Oregon and Hawaii. The US produces about 5% of all of the olive oil consumed in this country each year. US consumers use 90 million gallons of olive oil annually – the largest market outside of the European Community. 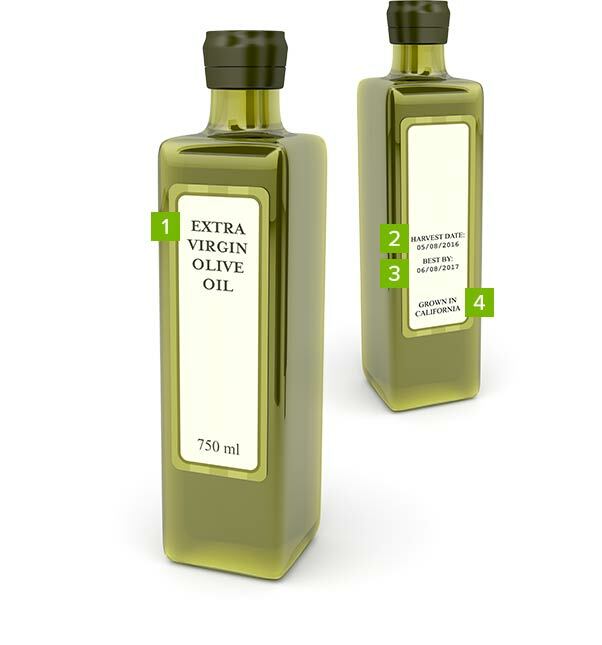 What should I look for on the label of a bottle or package of extra virgin olive oil? Grade The grade or quality of the olive oil should be prominently displayed on the front of the bottle. Extra virgin olive oil is the highest quality of olive oil available, which provides the highest level of health benefits. Harvest Date Harvest date provides buyers with the time-period in which the olives where harvested and milled to make the olive oil. Best By Date “Best by” dates are usually one to two years from the time the oil was bottled as determined by scientific testing. Where the olives were grown It is important to know the source of the olives that made the healthy, delicious olive oil in the bottle. You will find terms such as “product of” or “growing region,” providing the county, region, state or country where the olives were grown.